ADTECH - Analog Digital Technology, Inc. The Adtech Model LPI 25 Loop Powered Indicator is one in a family of the LPI Series of loop powered LCD indicators that provide user configurable ideal solutions for process indication. It comes in a NEMA 4X housing. 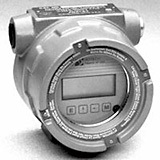 The LPI 25 accepts a process input signal of 4-20 mA and provides a 3-1/2 digit, 7-segment 0.5" LCD display. The 4-20 mA signal may be from a two-wire output loop or an output of a three-wire or four-wire transmitter. Power is derived from the input signal with no external power source required. The Adtech Model LPI 30 Loop Powered Indicator is one in a family of the LPI Series of loop powered LCD indicators that provide user configurable ideal solutions for process indication. It comes in a NEMA 7 Explosion Proof Housing. The LPI 30 accepts a process input signal of 4-20 mA DC and provides a 3-1/2 digit, 7-segment 0.5" LCD display. The 4-20 mA DC signal may be from a two-wire output loop or an output of a three-wire or four-wire transmitter. Power is derived from the input signal with no external power source required. 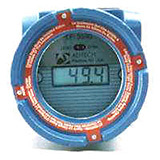 The Adtech Model LPI 40 Loop Powered Indicator (See LPI 30 Picture Above) is one in a family of the LPI Series of loop powered LCD indicators that provide user configurable ideal solutions for process indication. It comes in a NEMA 7 Explosion Proof Housing and is for integral use with the Adtech 100 Series Two-Wire Transmitters. The LPI 40 accepts a process input signal of 4-20 mA and provides a 3-1/2 digit, 7-segment 0.5" LCD display. The 4-20 mA signal may be from a two-wire output loop or an output of a three-wire or four-wire transmitter. The Adtech Model LPI 40D Loop Powered Indicator (See LPI 30 Picture Above) is one in a family of the LPI Series of loop powered LCD indicators that provide user configurable ideal solutions for process indication. It comes in a NEMA 7 Explosion Proof Housing and is for integral use with the Adtech 200 or 300 Series Two-Wire and Three-Wire Transmitters. The LPI 40D accepts a process input signal of 4-20 mA and provides a 3-1/2 digit, 7 segment 0.5" LCD display. The 4-20 mA signal may be from a two-wire output loop or an output of a three-wire or four-wire transmitter. The Adtech Model LSI 48 Loop Powered Integrator/Totalizer provides a user configurable ideal solution for field mounting of a totalizer with rate. The input may be a linear or squared 4-20 mA DC input signal typically from a flow meter. The LSI 48 provides a 4-1/2 digit LCD display for Rate and Totalization as a single unit display and may be easily user changed to 3-1/2 digits. It also provides a pulse output for remote totalization. Totalization is displayed as an 8-digit LCD display.